Having had recent occasion to look myself up on the Chinese Zodiac (nothing like a brief curiosity about love compatibility to inspire interest in astrology! ), I discovered that I was born in the Year of the Pig. The element for my particular birth year is Water, so I am a Water Pig! At first my response was blaaaaahhhh….pig? I’m a pig? I’m not the most abstemious of individuals, a character trait that pigs are also rather lacking, I think. So essentially the Chinese Zodiac just called me out, bam! But then The Simpsons Movie came to mind with that very non-catchy yet memorable jingle about Spider-Pig and all of a sudden I thought it was hilarious in a very I’m-the-only-one-that-thinks-this-is-funny type of way. Thus the tagline on my blog was born: Water pig, water pig, does whatever a water pig does, can it swim, yes it can, it’s a water pig! Ok, moving on. I don’t have any particular affinity for water. Not like this little piggy here. (No idea who took this picture…am I allowed to do that, just post it? Copyright issues confuse me, I better do some research.) I wish I could just magically go from being dry and clothed to wet and completely immersed in the water. Can’t we just skip all that awkward changing of clothes and adding extra articles of swimwear to cover up virtually everything my swimsuit doesn’t already cover? And also the mildly embarrassing half skip-walk to the water hoping no one is really paying that much attention to me? Yes, lets skip that and get right down to having fun in the water! 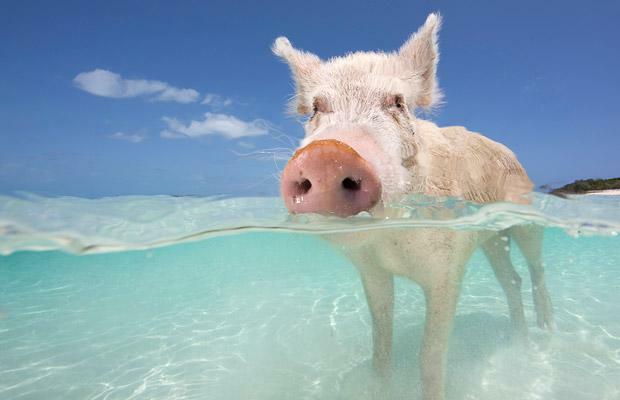 Apparently pigs can swim pretty well, and don’t seem to mind it at all. But this post isn’t about real pigs, or even about swimming pigs. It’s about me [according to Chinese astrology]. In general the descriptions I’ve seen are pretty accurate; except that I don’t find myself to be incredibly patient, or all that gullible, and especially not someone who will avoid conflict as much as possible. Nope, in fact, I’m rather fiery and conflict stimulates me. It can draw lines in the sand, which is not always a good thing, but it can also help you figure out what you stand for; help one define one’s passions. Knowing what you are passionate about is a good thing. Books! Books! Books! Did I mention books? Writing – look who’s blogging?? This girl! I think this mini novella is enough for now, the end.